Did you ever wonder what the "other guys" were thinking? Here are two collections of essays written by Soviet Submariners. "I am a 66-year-old resident of St. Petersburg, Russia, on a pension now after 40 years in marine engineering. The last years of my service I was engaged in publishing recollections of the Soviet Navy veterans, mostly retired Submariners. Now I have enough time at my disposal while keeping all the necessary contacts and access to the materials of the kind. So I decided to translate (or rather re-tell) some of the Soviet Submariners' recollections and offer them to people abroad, in the first place to the U.S. Navy Submariners. These essays are just homemade pocket-sized booklets with a minimum of illustrations. My English is far from being good too, but I hope it is understandable". Booklet #1. "Born Twice" by Rostislav Belozorov Re-Told and Translated by Cyrus Idashkin. The above story is as scarey and captivating as the story of the USS Squalus (SS-192) rescue. "Born Twice" is an absolute MUST READ for all Submariners. Booklet #2. 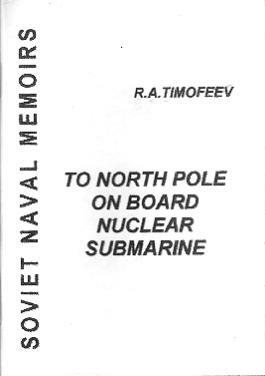 "To North Pole on Board Nuclear Submarine" by Ryurik Timofeev Re-Told and Translated by Cyrus Idashkin. I have two of his booklets. And have written him on several occasions. He is a very interesting fellow. The booklets he writes are very worth the reading. Most of them are about 60 pages long. Very easy reading and fun. I couldn't believe the things the Russians"s went through on the boats they have! PS. Bookmark this site and check back often for New Titles currently being translated.